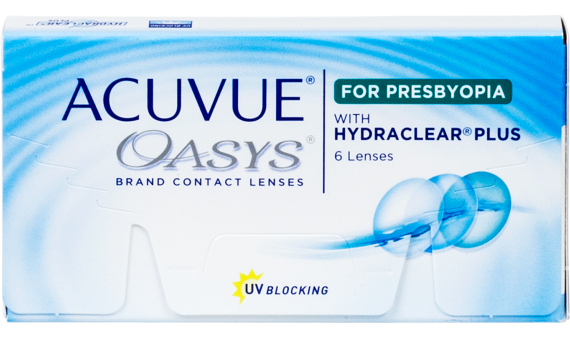 ACUVUE OASYS® for Presbyopia Contact Lenses with HYDRACLEAR® PLUS Technology are contacts that are comfortable, smooth and feel like you aren't even wearing them. 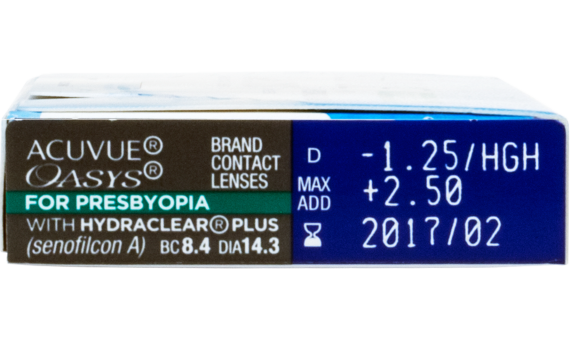 Designed for people with presbyopia, these multifocal contact lenses provide balanced vision at any distance. The patented HYDRACLEAR® PLUS Technology mixes the wetting agent into the contact lens formula itself, working in harmony with your eyes. ACUVUE OASYS® lens are made with digital-device usage in mind. Not only that, they are great for challenging environments for your eyes like air conditioning or dry air that can cause discomfort and irritation, especially for people with presbyopia. ACUVUE OASYS® Brand with HYDRACLEAR® PLUS Technology is inspired by the way your tear film works to help comfort. Plus these lenses help provide protection from UV radiation.